The dramatic growth of population in Africa since the 1950s has substantially accelerated water demand among nations, especially in Southern Africa where freshwater is extremely valuable and vulnerable. The Northern Kalahari Aquifer (NKA) system, the second largest aquifer basin in Southern Africa (Figure 1), underlies the southern-facing slopes of the Angola High Plateau (AHP), and is located between the rich Congo Intracratonic Basin to the north and the deep Southeast Kalahari Aquifer system to the south. Indeed, most of the headwaters of major rivers in Southern Africa including the Okavango and the Zambezi Rivers are located on the AHP, which provides a large amount of water recharge to the underling aquifer systems. The AHP is dominated by woodland savanna and tropical montane forests and grasslands, a complex transitional ecosystem between the Congo tropical rainforest and the Kalahari Desert. The Zambezi River is the fourth-largest river in Africa, which cuts across the subcontinent to discharge in the Indian Ocean. The Upper Zambezi River Basin (UZRB), separated from the lower part by Victoria Falls, provides essential freshwater resources to land-locked arid and semi-arid regions in between (Figure 1), and is the major recharge area to the NKA, demonstrating vigorous surface-ground water interactions in the region(shown by Figure 2). Despite its critical role in providing substantial water recharge to the NKA which provides most of the local freshwater resources, the hydroecology of the UZRB and its role in the regional water cycle have not been investigated previously by comprehensive hydrological modelling. This vacancy is attributed to the limitation of the accuracy of forcing datasets and the availability of ancillary data to support appropriate physical representation of hydrological processes, since there are virtually no ground-based hydrologic or hydrometeorological measurements to support modeling activities and much less predictive studies in the UZRB. Nevertheless, combining satellite data with proficient hydrological models fosters a promising solution to address science needs in this region. 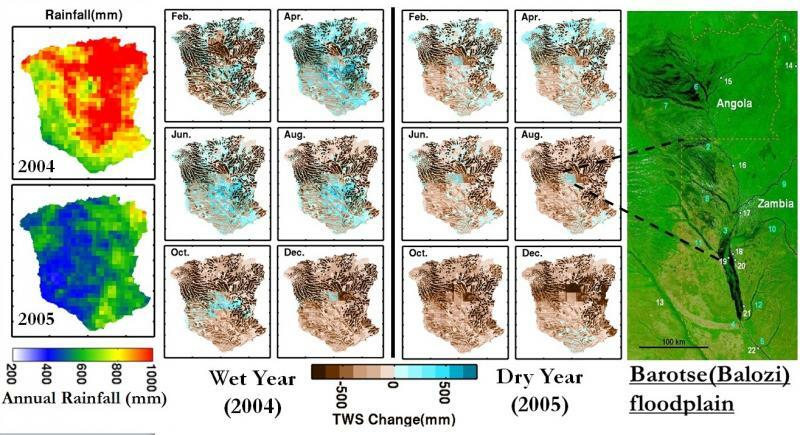 For example, the terrestrial water storage anomaly (TWSA) observations by NASA’s Gravity Recovery and Climate Experiment (GRACE) satellite provide a unique opportunity to evaluate and constrain basin-scale hydrologic models at large spatial scales. The time series of the UZRB basin-averaged GRACE TWSA demonstrates an obviously increasing trend during the last decade from 2003 to 2012 (Figure 3). 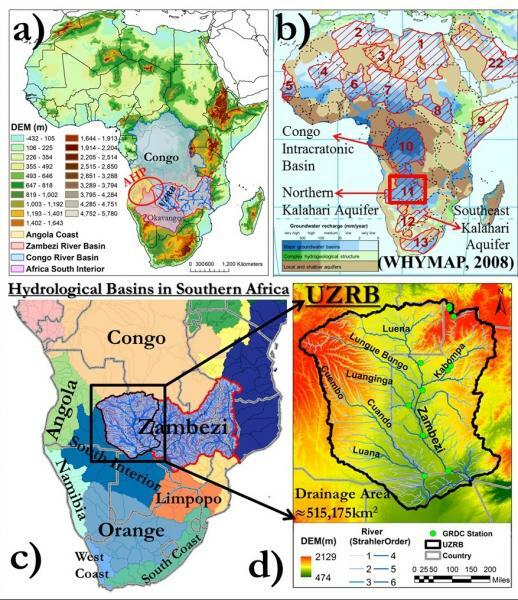 Furthermore, through Data Assimilation techniques to optimally merge satellite observations and hydrological models, there is an opportunity to investigate hydrological processes and to develop a quantitative understanding of the regional water cycle in what is arguably the most critical river basin in Southern Africa. For this purpose, we will develop a Hydrologic Data Assimilation System (HDAS) which relies on a three-dimensional coupled surface-groundwater hydrology model (3D-LSHM) (Figure 4) integrated with an EnKF-based (Ensemble Kalman Filter) and/or EnKS-based (Ensemble Kalman Smoother) data-assimilation system (Figure 5), to characterize the seasonal (wet/dry) and inter-annual variability of the water budget of the UZRB and the NKA at high temporal-spatial resolution. The modeling system will subsequently be used in prognostic mode to assess the impact of land-use and land-cover (LULC) and climate change scenarios on water resource availability in the Upper Zambezi. The overarching goal of the proposed research is to characterize regional water budget and water cycle at least for a ten-year period and to assess the vulnerability of water resources in Southern Africa, illustrated by the study in the UZRN and the NKA. In particular, the proposal has three specific science objectives: 1) to advance understanding of the spatio-temporal variability of surface-groundwater interactions in the region, and to characterize the regional water budget change in the terrestrial system and the subcomponents of the terrestrial system(e.g. surface water, soil water storage, and aquifer water storage) at both the seasonal and inter-annual time-scales; 2) to investigate the impacts of ongoing rapid land-cover-land-use (LCLU) change caused by both anthropogenic and non-anthropogenic factors (e.g. deforestation for agriculture, urbanization, mineral exploitation and wildfire) on the regional water cycle and vulnerability of water resources; and 3) to evaluate and predict how the availability of regional freshwater resources will respond to climate change in the following decades. The research hypothesis is four-fold: i) the vigorous surface-subsurface water interaction along the regional drainage network is very important for the long term sustainability of aquifers; ii) landform modulates soil-vegetation-atmosphere interactions in the AHP along altitudinal and latitudinal gradients, causing remarkable vegetation gradients which dynamically affect the soil and aquifer water storage at seasonal cycle; iii) the LCLU changes on the AHP and in the UZRB can alter dramatically the water cycle and overall water resource availability in the region; iv) the freshwater resources in Southern Africa are highly vulnerable and sensitive to external driving factors or disturbances, such as climate change and LULC change. Figure 1: a) Angola High Plateau (AHP) plays an important role in partitioning water resources from precipitation among key major basins in the Southern Africa, and is a critical recharge area for the Northern Kalahari Aquifer (NKA) system. b) shows the large major aquifer systems in Africa. The NKA is between the rich Congo Intracratonic Basin and the deep Southeast Kalahari Aquifer system. c) illustrates the location of the Upper Zambezi River Basin (UZRB) while displaying the major river basins in Southern Africa. d) shows the digital elevation model(DEM) of the UZRB, also displaying the river systems of the area. Figure 2: Surface-Groundwater interaction is vigorous and highly nonlinear, showing large inter- and intra- variability, but staying active all year along in the floodplain. Figure 3: The time series of GRACE terrestrial water storage anomaly (TWSA) observations averaged over the UZRB area; the corresponding rainfall time series calculated from TRMM 3B42 product is also shown with the y-axis on the right. 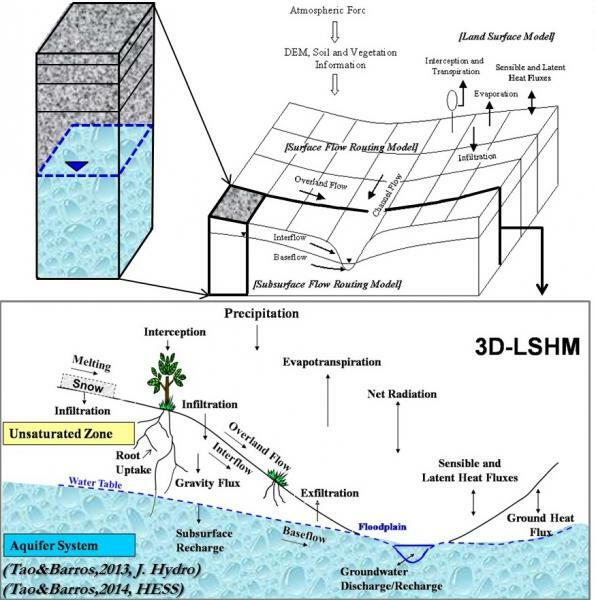 Figure 4: The schematic diagram of the 3D Land surface hydrologic model (3D-LSHM), displaying the one-dimensional soil column, two dimensional cross section and the three dimensional structure. 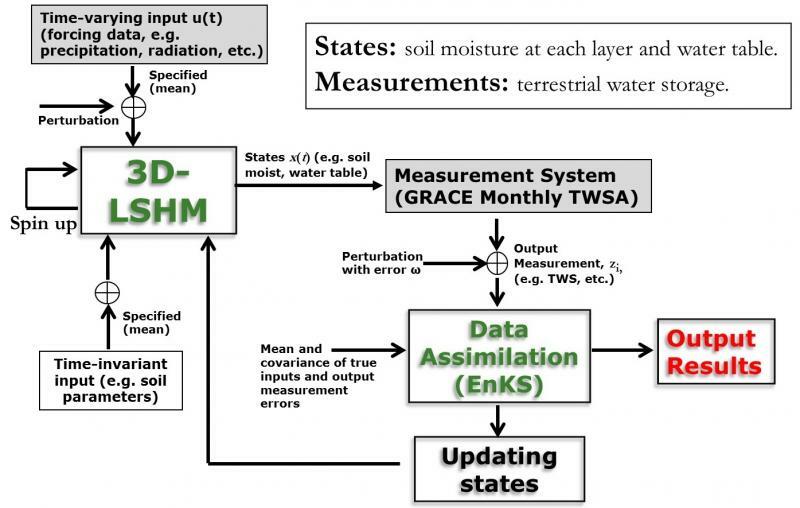 Figure 5: The flowchart of the Hydrologic Data Assimilation System (HDAS), illustrated by the example of assimilating GRACE monthly TWSA data into the coupled surface-groundwater flow model (3D-LSHM).